Fig. 1: Opening levels at Trench A. Left to right: Heather Kelly, Jacob Spier, Jeffery Spier, Allisa Stoimenoff, Mary Voyatzis, Monique Kornell. Fig. 2: Ximena Valle drawing at the east end of the stoa. Fig. 3: South end of the hippodrome, with trenches. Fig. 4: Bailing out Trench A after heavy rain, Alexis Belis, Allisa Stoimenoff and Heather Kelly. Fig. 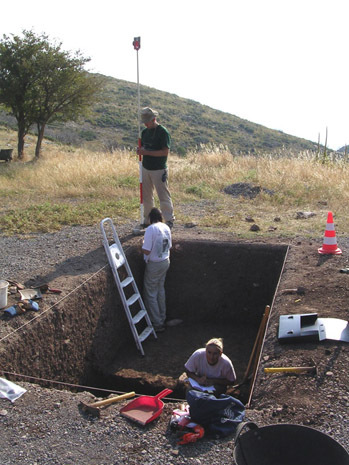 5: Trench A at lower levels, Nick Kendall with reflector, Heather Kelly and Allisa Stoimenoff. Fig. 6: Standing in the doorway of the Cultural Center in the rain, back row, Miranda Gardiner, Susan Mentzer, Pam Jordan, Tom Fenn, Nick Kendall, front row Ximena Valle, John Lee, Lois Kain, Leslie Hammond. Fig. 7: Leslie Hammond at her desk. Fig. 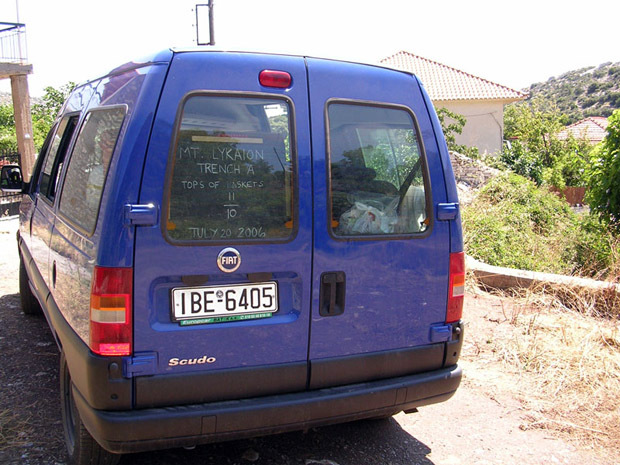 8: Trusty blue Fiat van, Zeus. Fig. 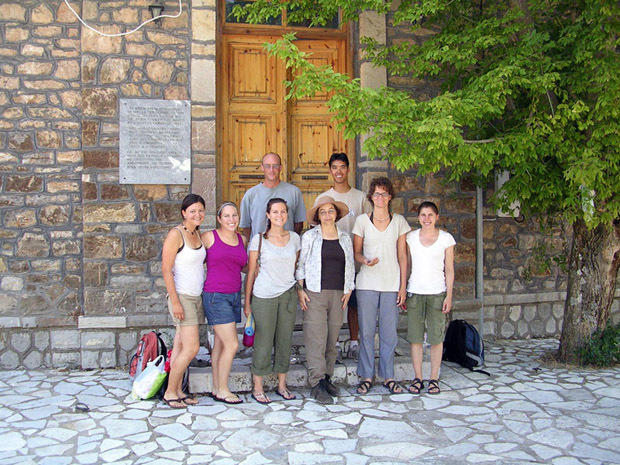 9: Planning for the future: Village Syllogos leaders meeting with project staff, Susan Petrakis, Mary Voyatzis, Anastasia Panagiotopoulou, Christos Koumoundouros, Kyriakos Karagiannis, Kathy Koumoundouros. Fig. 10: Thannasis Christeas cleaning the sanctuary seats. Fig. 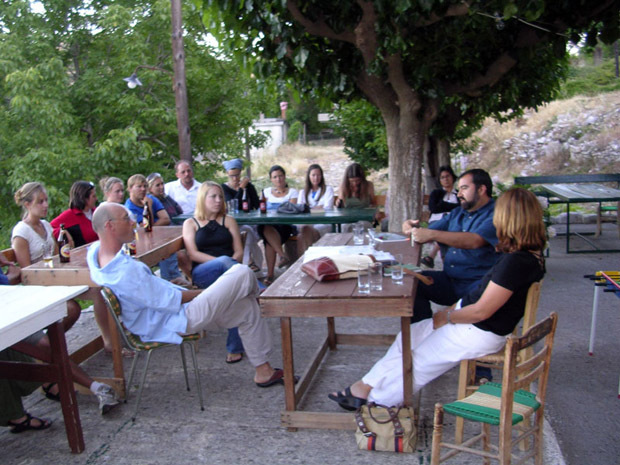 11: Professor Yanis Pikoulas giving a lecture in the village plateia. Fig. 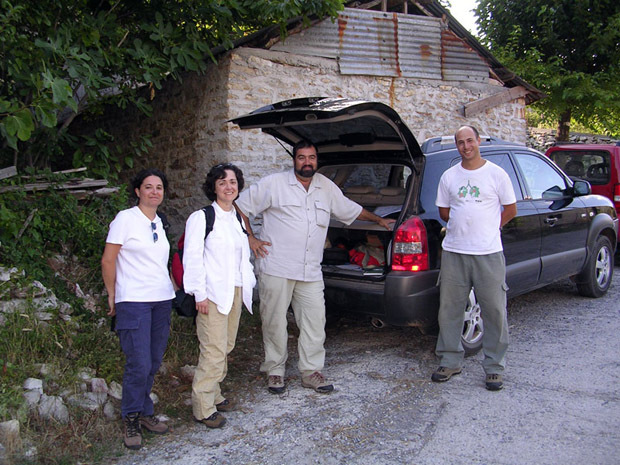 12: Professor Yanis Pikoulas with students, Evangelia P. Eleftheriou, University of Thessaly, George Terais, University of Thessaly, Eleni Salavoura, University of Athens. Fig. 13: Tom Fenn discussing the topographical survey in the Cultural Center. Fig. 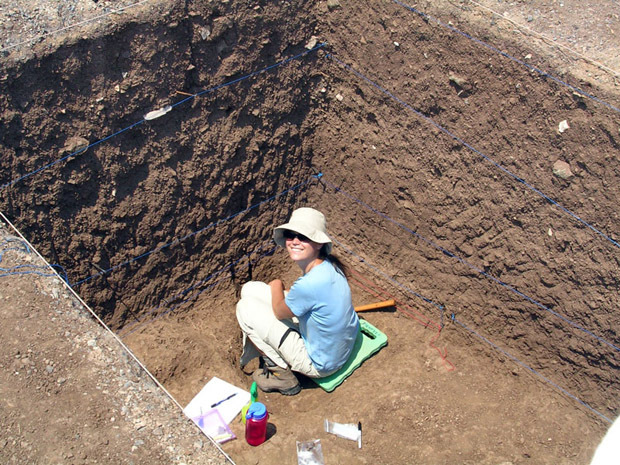 14: Susan Mentzer taking soil samples in Trench A. Fig. 15: In front of Xenona in Kastanochoroi, back row, Tom Fenn, John Lee, front row, Ximena Valle, Miranda Gardiner, Susan Mentzer, Susan Petrakis, Pam Jordan, Alexis Belis. Fig. 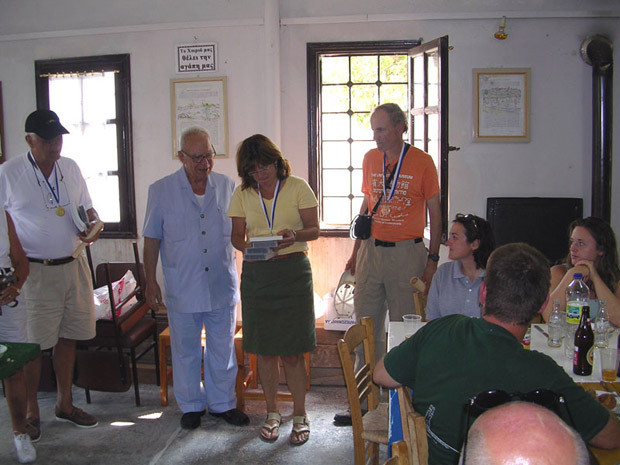 16: Mary Voyatzis, center, receiving awards from Nikos Kostopoulos, near left, on occasion of visit of Mr. and Mrs. Nicholas Karabots, far left. David Romano, right. Fig. 17: Trench talks at Trench A. Allisa Stoimenoff, center, speaking. Fig. 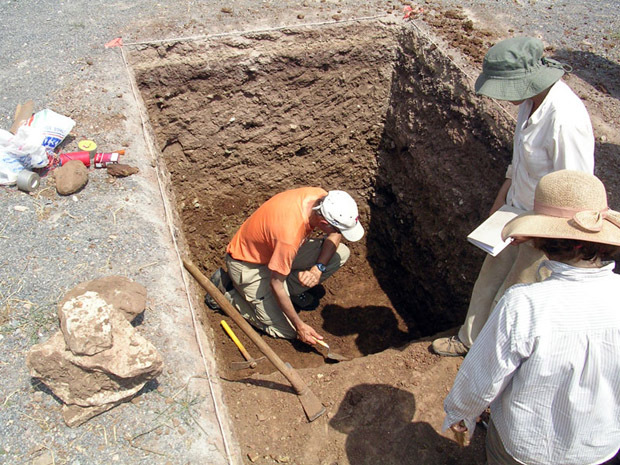 18: David Romano working in Trench C.
Fig. 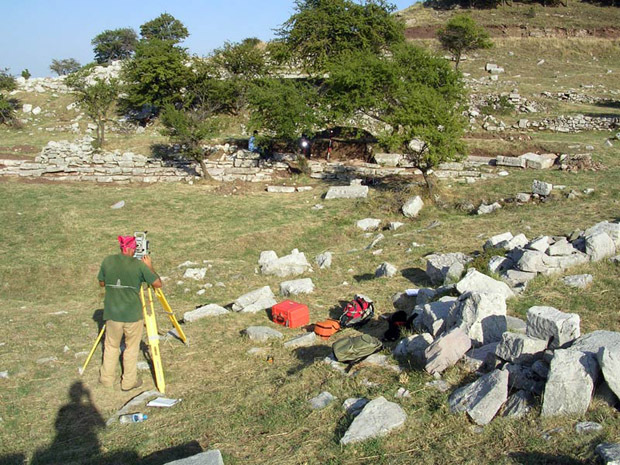 19: Tom Fenn surveying in the area of the sanctuary seats. Fig. 20: Group photo 2006. Fig. 21: Final dinner 2006 in Karytaina. 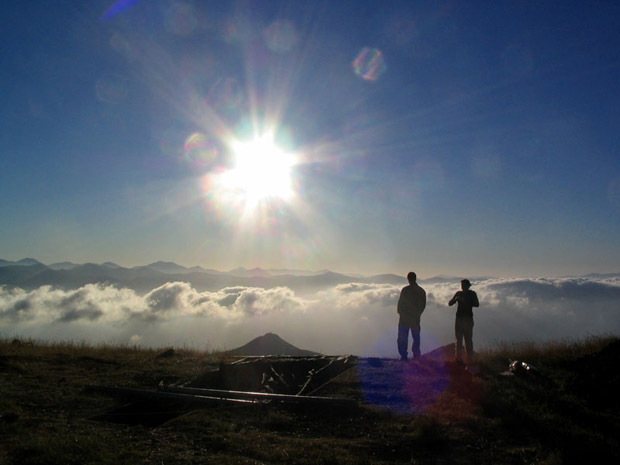 From June 26 through August 7 a group of researchers conducted their investigations of the sanctuary of Zeus on Mt. 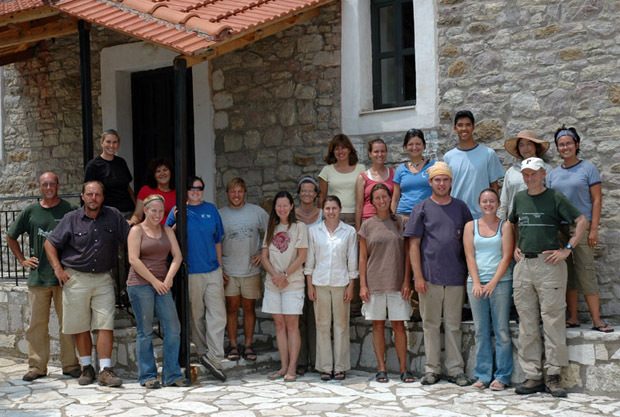 Lykaion, where they have been working every summer since June 2004. 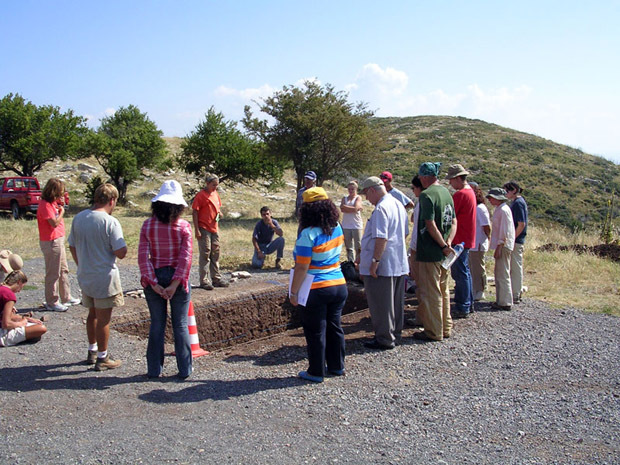 The team included specialists from the University of Pennsylvania Museum of Archaeology and Anthropology, together with a team from the University of Arizona, and in collaboration with the 5th Ephorate of Prehistoric and Classical Antiquities in Sparta, The co-directors of the project are Dr. David Gilman Romano of the University of Pennsylvania Museum, Dr. Mary E. Voyatzis of the University of Arizona and Dr. Anastasia Panagiotopoulou of the 5th Ephorate of Prehistoric and Classical Antiquities, Sparta. 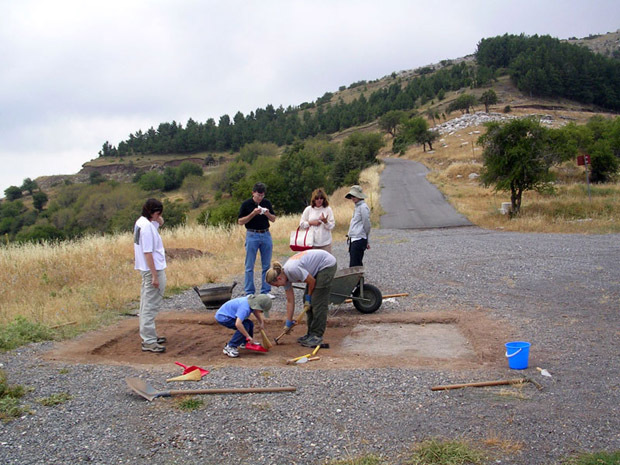 The excavation is made possible through the generosity of individual, foundation and Greek-American support from the United States and is run under the auspices of the American School of Classical Studies at Athens. The financial support and generosity of Mr. and Mrs. Nicholas Karabots of Fort Washington, Pennsylvania is especially worthy of mention. 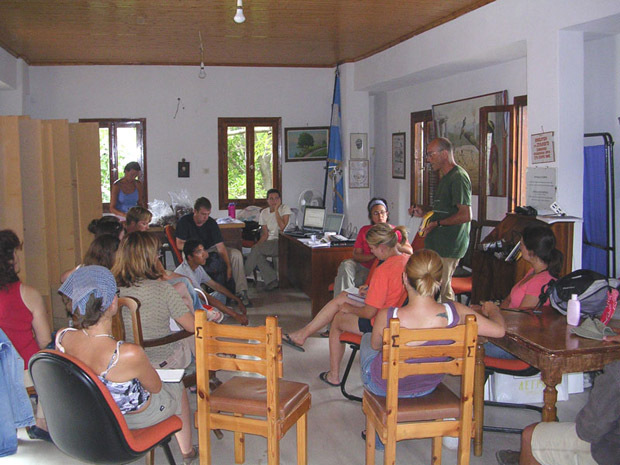 The team that numbered up to 25 students and staff stayed in village accommodations in Ano Karyes and in Xastanochoroi. The project especially appreciates the cordial and helpful assistance given to all members of the team by the Syllogos of Ano Karyes, Kyriakos Karagiannis, President. 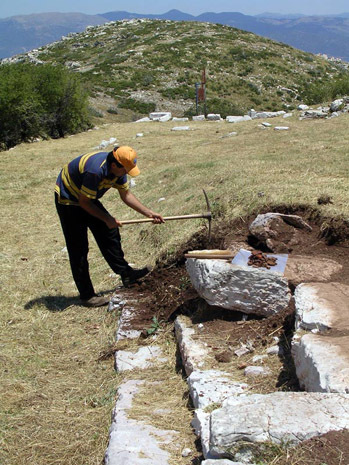 Workmen from the Greek Archaeological Service cleared the site of brush and high grass. They also served as workmen for the trenches that were dug in an area in and around the hippodrome (below). A representative of the Greek Archaeological Service was present for the season, Ms. Angelike Tsingkou, and we thank her for her assistance and good will. The work was divided into several parts. A topographical and architectural team continued the work of documenting the actual-state remains of the 67 m long stoa at the site. A topographical team is surveying the exact location of every above-ground and visible block and the architects, under a grant from the Samuel H. Kress Foundation, are making measured hand drawings of every significant architectural block at the site to create what will become the first actual-state stone-for-stone drawing of the site. A series of steps or seats, ca. 40 m long, were exposed to the north of the stoa and at a lower elevation. The architects began to create an actual-state drawing of this series of blocks. 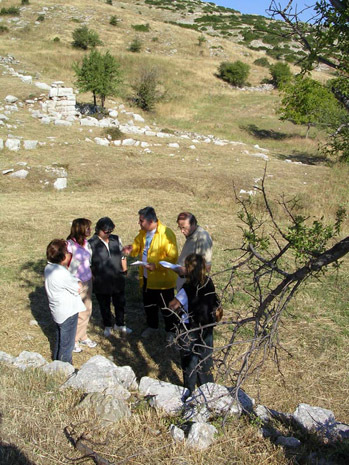 Professor Yanis Pikoulas of the University of Thessaly began his historical survey of the sanctuary and the general region of Mt. Lykaion. 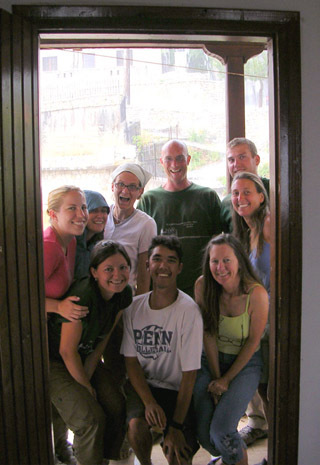 He brought three students for fieldwork and was exploring neighboring ancient sanctuaries, cities and roadways. 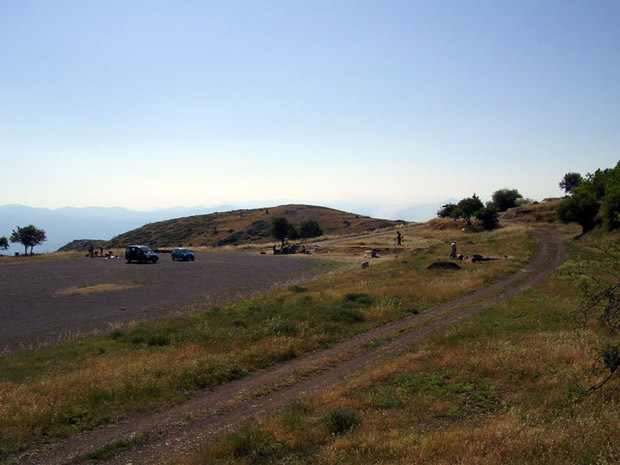 Mark Davison of the University of Oregon was present to begin a cultural landscape study of the region of the Sanctuary of Zeus at Mt. 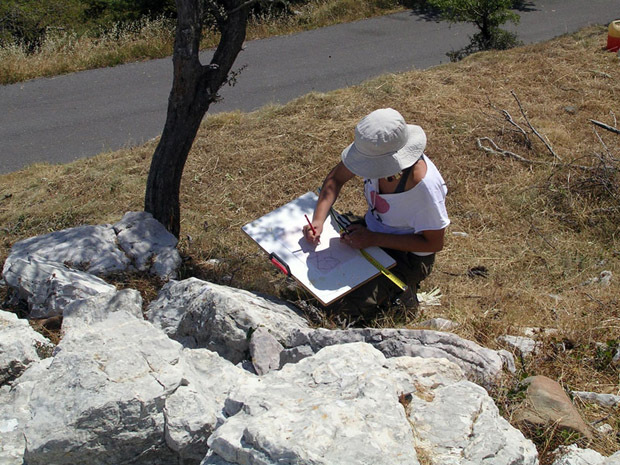 Lykaion looking closely at the nature of the mountain landscape and the ways in which a cultural database will be presented and might be extended to include a larger area of land for the proposed national cultural park. Four trial trenches were opened in the area of the ancient hippodrome and its immediate surroundings. Working at the southern aspect of the ancient facility a trench was opened to look for the southern limit of the racecourse floor. A second trench was opened to look for the eastern limit of the racecourse floor near what may be the southeastern area of the hippodrome. A third trench was dug in the hippodrome floor, looking for evidence of the floor itself as well as looking for what may have been the dromos floor of the stadium (which is set inside the hippodrome). Bordering the southwest side of the area of the hippodrome, on a slightly higher terrace, a fourth trench was dug and ancient levels were discovered. These four trenches yielded a large amount of ancient pottery sherds, roof tiles, and some metalwork, including bronze coins and an iron blade. Teresa Moreno was our conservator for the finds, which have all been cleaned, conserved and are currently housed in the nearby Lykosoura Museum.